The core of AU’s Reinventing the Student Experience (RiSE) initiative is the rollout of the American University Experience classes—AUx1 and AUx2. The university conducted two successful AUx pilot programs during academic years 2016–2017 and 2017– 2018, which boosted retention rates. In 2016–2017, the one-year retention rate for students enrolled in AUx was 94.7 percent versus 89.1 percent for those not enrolled. In 2017–2018, preliminary results show that AUx students are again retaining at higher rates overall, with the strongest returns coming from those benefitting from both AUx and a newly created first-year academic advisor position. Students with both interventions are currently retaining at rates 2 to 4 percentage points higher than their non-AUx counterparts. These factors include whether students feel included on campus, whether they feel that professors care about them as people, and whether students know how to navigate university services and where to go to resolve problems. The 2017–2018 pilot also incorporated the new first-year advising program, which assigns a dedicated first-year adviser to each incoming student. “Each adviser will have no more than 76 students,” Waters says, compared with the national average of one adviser to 300 students. 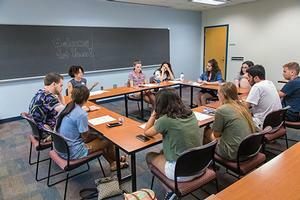 First-year advisers also teach AUx1 in the fall semester, so they see their advisees at least once a week. In the 2018–2019 academic year, all incoming first-year students are participating in the AUx and first-year advising programs for the first time. RiSE’s financial aid pilot, which began in 2016, continued through the 2017–2018 academic year. The goal of the pilot has been to boost completion rates for three components of the financial aid process: timely filing of financial aid applications, submission of required documents, and fulfillment of Satisfactory Academic Progress (SAP) requirements. The pilot assigned a financial aid counselor to each of the participating sophomores, starting with the cohort that entered in Fall 2016 and continuing with the Fall 2017 cohort. Counselors conducted one-on-one meetings with their students and provided personalized communication and guidance. Sharon Alston, vice provost for undergraduate enrollment, says the initial pilot showed that 70 percent of the cohort filed applications by April 1, 2017, one month ahead of the deadline, as compared to 62 percent in 2016. Ninety-five percent completed financial aid requirements by the start of the academic year, as opposed to 90 percent previously. The pilot also showed a nearly 50 percent decrease in the number of need-based aid recipients who failed to meet minimum SAP standards. On May 1, 2018, the financial aid model expanded to include all undergraduate and graduate students.